FREE Admission provided by MGM Resorts International. Please note that S. Commerce Street is under construction, but is open for business. The road is only accessible from Main Street. If you are driving north on Main, turn left at Gambler’s General; heading south on Main, turn right at Gambler’s General. Drive forward and look for the colorful Tilting the Basin graphics on the building. The Art Museum at Symphony Park (AMSP), the group advancing a future art museum in Las Vegas, and Reno-based Nevada Museum of Art, the state’s only accredited art museum, have partnered to present an exhibition showcasing the most significant contemporary artists living and working across Nevada today. 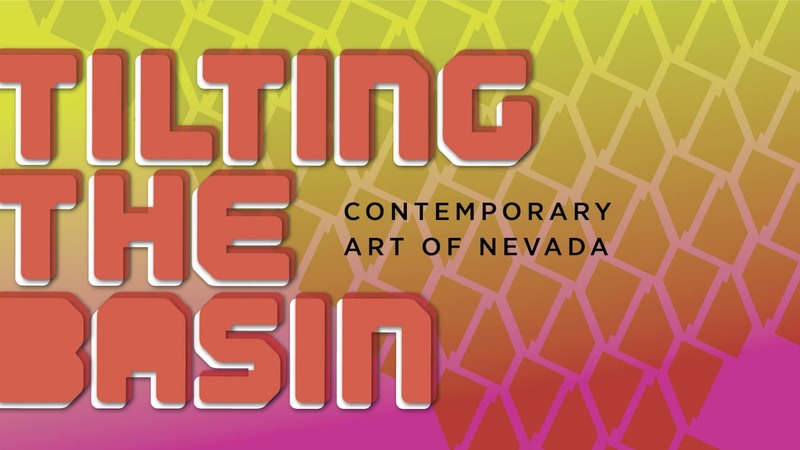 Tilting the Basin: Contemporary Art of Nevada bridges the divide between Northern and Southern Nevada communities, providing a broad overview and deep understanding of the most accomplished work being created by more than thirty artists living and working in the Silver State. The exhibition is co-curated by Nevada Museum of Art Curatorial Director and Curator of Contemporary Art JoAnne Northrup; and Las Vegas-based art advisor Michele C. Quinn, owner of MCQ Fine Art, LLC. Tilting the Basin: Contemporary Art of Nevada opened to much acclaim in northern Nevada, showcasing the vibrant creative fabric binding the Silver State. On the heels of the wildly successful Ugo Rondinone: Seven Magic Mountains, co-produced by Nevada Museum of Art and Art Production Fund, a dialogue emerged about the future of visual arts across the state. To further develop that conversation, Nevada Museum of Art and members from the Seven Magic Mountains Las Vegas committee envisioned an exhibition that would look inward, and celebrate the serious work being generated by talented artists spanning the Great Basin. Those discussions led Quinn and Northrup to curate Tilting the Basin. Concurrently, The Art Museum at Symphony Park effort was underway in Las Vegas, and AMSP president Katie O’Neill, along with Nevada Museum of Art Executive Director and CEO David Walker, crafted a plan to bring the exhibition to Las Vegas. Tilting the Basin highlights the work of six artists in depth, showing several examples from each in a variety of media. Featured artists include Galen Brown, Justin Favela, Katie Lewis, David Ryan, Brent Sommerhauser, and Rachel Stiff. The remaining artists’ work gives visitors a wide-ranging picture of the art being created across Nevada today, including painting, sculpture, drawing, photography, mixed media, street art, installation, sound performance, fiber arts and new media. Some work will live exclusively on social media; others, exclusively as a street mural. During the show, AMSP and Nevada Museum of Art will host several public and educational programs designed to foster community dialogue surrounding the various exhibition themes, including what it means to consider a future, permanent art museum in Las Vegas. Those events are listed below.